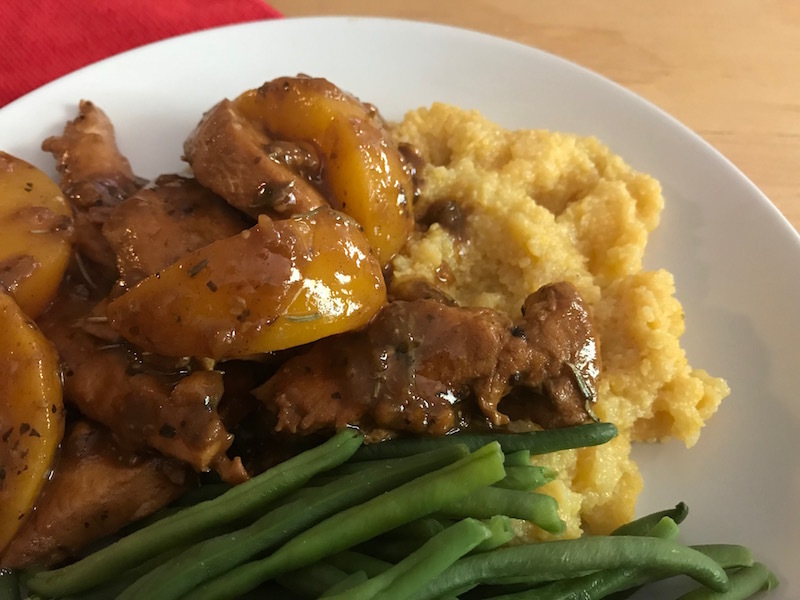 Double Peach Chicken | Keep It Up, David! My first recipe of 2018! It’s a good one, inspired by a recipe I found on the back of a bottle, and then forgot about for months! Last September, I went hiking with friends, to a rocky coastline still littered with debris from a shipwreck that happened 50 years ago. (Read about it here!) 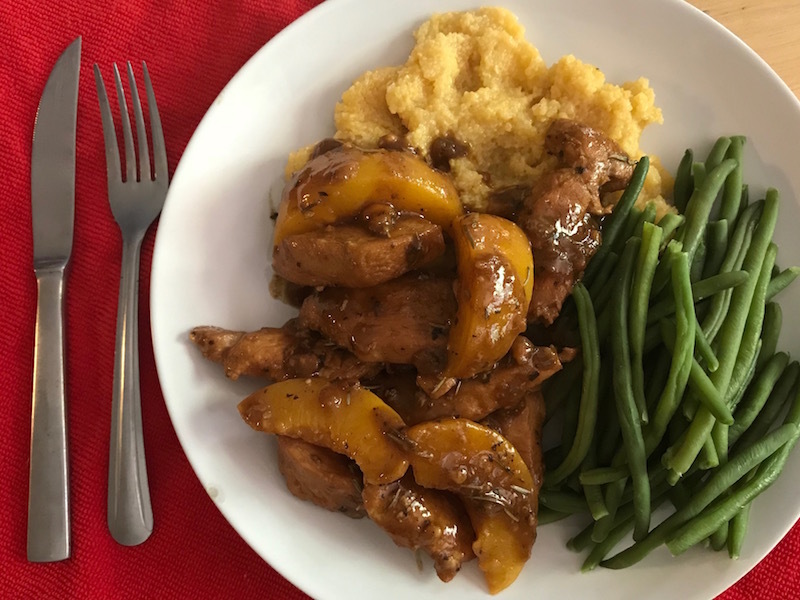 We went to lunch afterwards, and I was intrigued by the recipe for Peachy Chicken that I found on the back of the bottle of Heinz malt vinegar on our table. So I snapped a photo of the recipe. That recipe was for a lot of people: you need 2.5 pounds of chicken to make it. I cut the recipe down to a more manageable size, and made some changes: some based on ingredients I did or didn’t have, and also to remove some added sugar and make it even peachier. 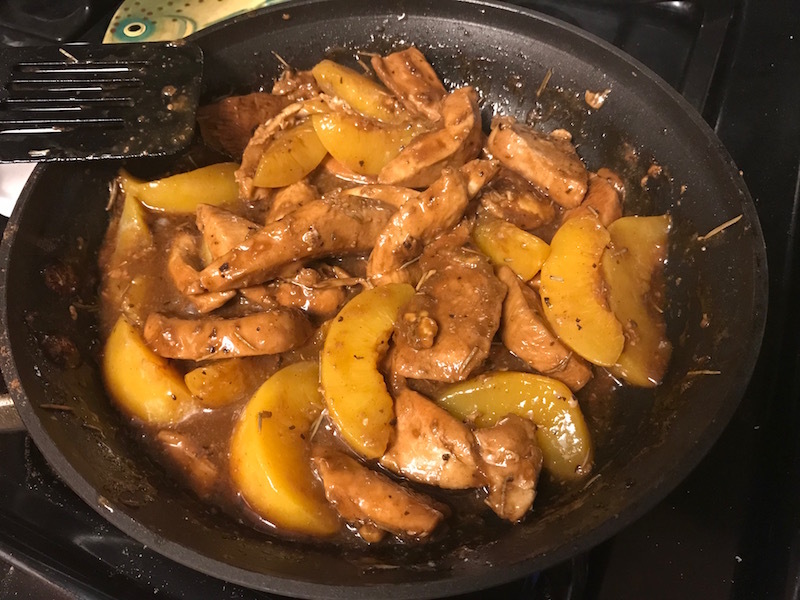 That’s what I call my version Double Peach Chicken. And here’s how you make it. 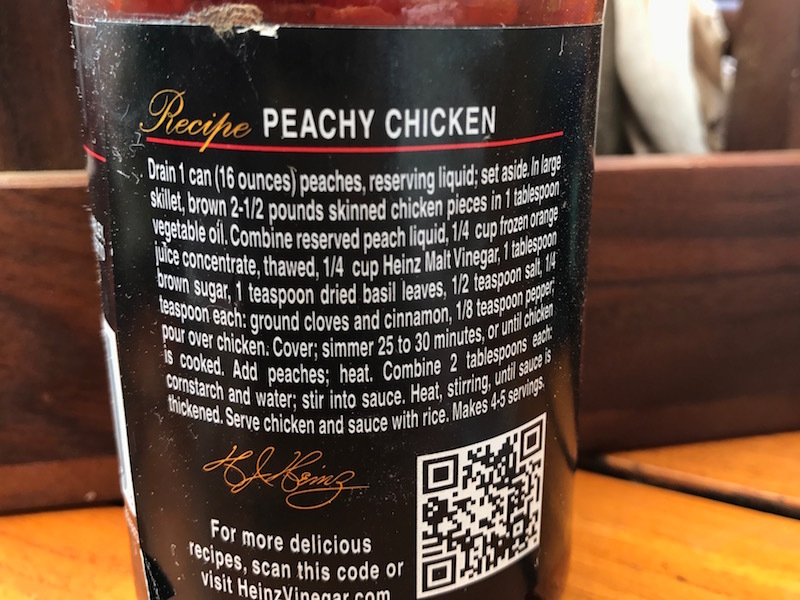 After the chicken has started to brown a little bit, you’ll add the ingredients you need to make the double peach sauce. First, drain a 15-ounce can of peach slices, but save the liquid. Always buy canned fruit in 100% juice – less calories and sugar than fruit canned in heavy or light syrup. Set the slices aside, you’ll need them later. 1/4 cup of the reserved juice from the peach can. 1/4 cup peach nectar. Did you know that the juice in a can of peach slices is mostly pear juice? Read the ingredients list, it’s true! 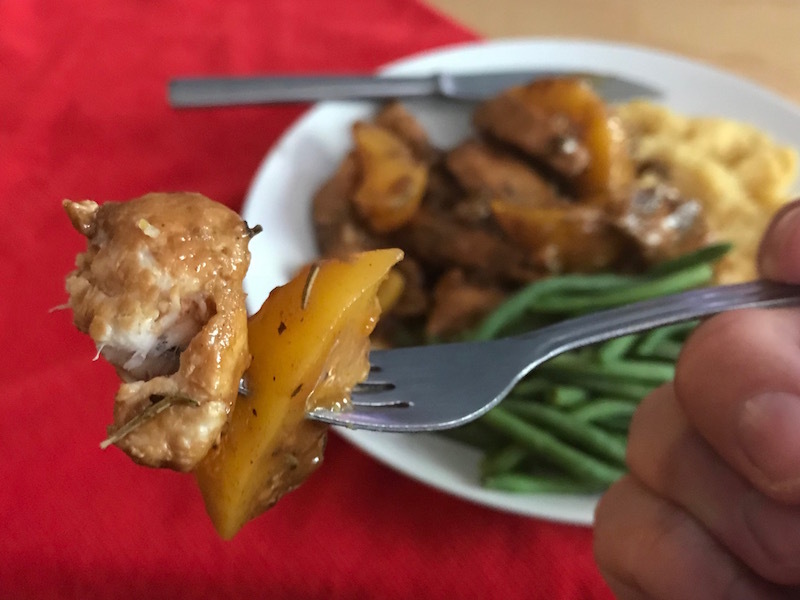 So I add this 1/4 cup of peach nectar to amp up the peach flavor – it’s why this recipe is called double peach chicken! Oh, and I bought a 12-ounce can of Kern’s peach nectar at the store for 79 cents, and since I only needed 1/4 cup of it, I stashed the rest in my fridge and used it for peachy protein shakes. 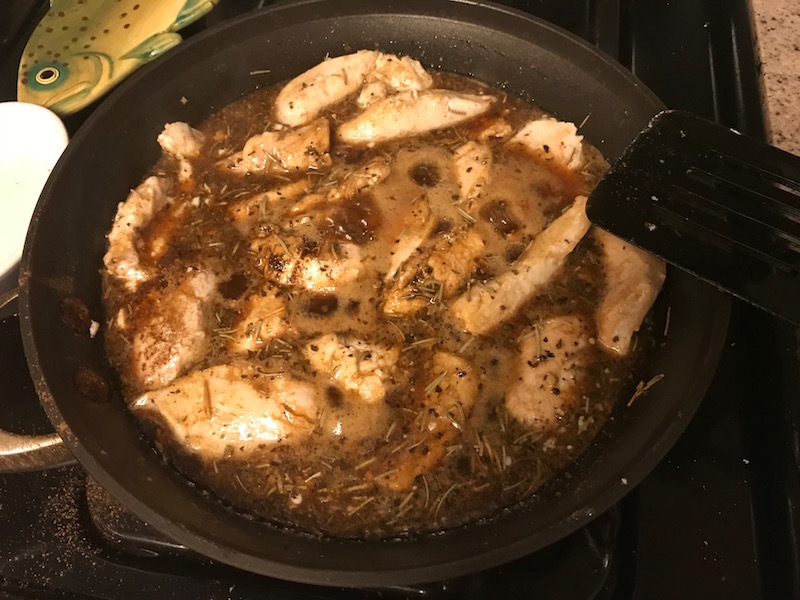 Now there’ll be a lot of liquid in your skillet, so cover it, reduce heat to medium low, and let it simmer 15-20 minutes, until the chicken is cooked through. 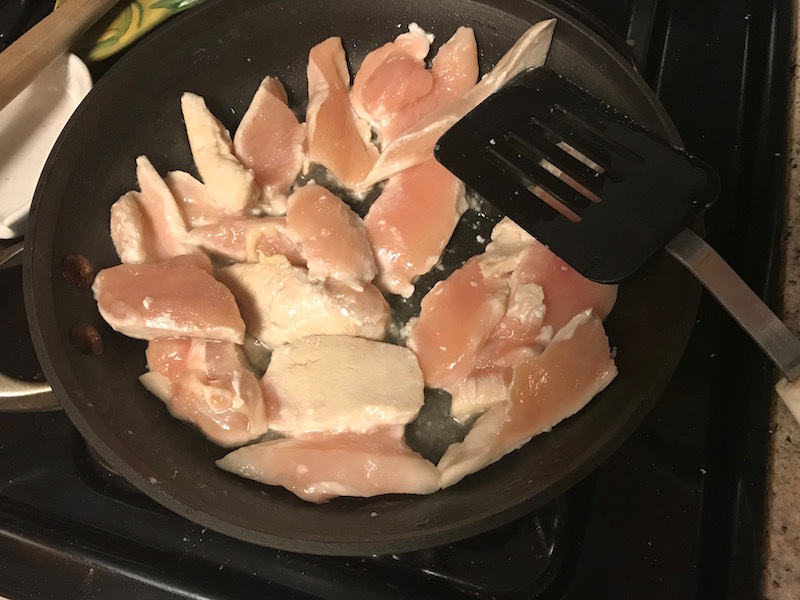 It’s almost like your chicken is poaching in all that flavor! After the chicken was almost cooked, I sprinkled 1 teaspoon all-purpose flour to help the sauce thicken up, which only took a minute or two. This was also when I added the peach slices from the can that I had previously set aside. I just stirred it all up a little bit, so the peaches got warm and coated in the sauce. I wanted them to keep their shape and texture, which is why they didn’t simmer in there the whole time. And there you have it, your Double Peachy Chicken is done! I divided it up into two portions, and saved one for the next day. For dinner, I ate it with steamed green beans and a serving of grits. Grits are a very new thing in my kitchen. My friend Jen gave me a canister of grits when she moved out of town last month, and while I had eaten them once or twice at a restaurant, I had never made them. They’re super easy to make, a great base for a dish like this, because they soak up sauce and flavor well. One serving of grits (1/4 cup dry grits) is 130 calories – and while they’re not especially nutritious, 130 calories isn’t going to throw off your meal or your day. I cooked these grits with low-sodium chicken broth, but I’ve also cooked them with water, and once with milk. What’s your favorite way to cook grits? Anyway, back to the chicken. It’s juicy and flavorful, and while the peaches and peach nectar make it fruity, the vinegar and herbs make it a more complex taste, that’s not overly sweet. It definitely doesn’t taste like dessert! This entry was posted on Wednesday, January 10th, 2018 at 12:15 am and is filed under Uncategorized. You can follow any responses to this entry through the RSS 2.0 feed. You can leave a response, or trackback from your own site.